A lot changed in 50 short years. In this historical photo from the U.S. space agency, fifty years of history and 31,999,99 horsepower mark the difference in these two pictures taken at the front of Michoud Assembly Facility (MAF) in New Orleans, Louisiana. 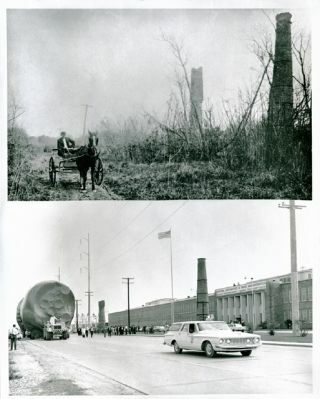 The top image shows a 1915 horse and buggy passing in the front of the old Michoud Plantation. The bottom image is a 32 million horsepower Saturn I booster passing over the same road. The brick chimneys, the remnants of the Antoine Michoud Plantation built in the mid-1800s, still remain as in 1915. Michoud Assembly Facility built the stages of Saturn I, Saturn IB and Saturn V vehicles under the management of Marshall Space Flight Center (MSFC).